If an Org has two nodes immediately below the prime node there is an issue with including all records owned by users in these two nodes. 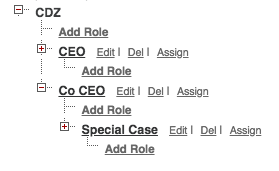 Under the prime node CDV there is a CEO and a Co CEO node. When defining the scope of records in a report filter the prime node, CDZ, cannot be selected. 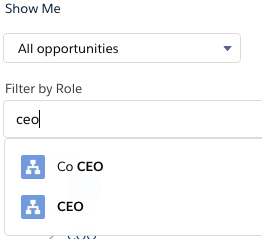 A choice has to be made between one or the other CEO node. This is not a problem in a list view since all opportunities can be selected in the record scope without having to choose a node other than the prime node as is the case for reports. The workaround is to either use a list view or create the report in Classic where all opportunities can be selected. Note that if you edit the report in Lightning after it has been created in Classic it will assume the above behaviour and the report will be limited to the first CEO node. 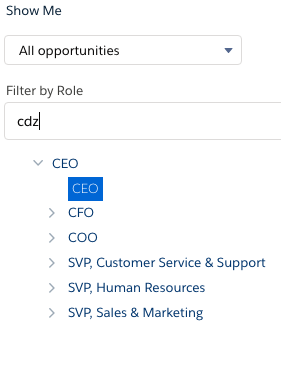 This entry was posted in Blog, How To, Salesforce and tagged bug, LEX, Lightning by admin. Bookmark the permalink.